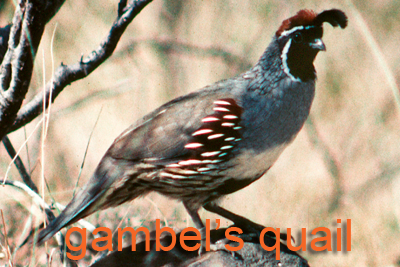 These include all varieties of wild turkey, bobwhite quail, scaled quail (blue), Gambel’s quail, pheasants, and chachalaca. Dates of specific seasons vary. To hunt upland game birds, in addition to a valid hunting license, you will need an Upland Game Bird Stamp Endorsement, available where you purchase your license. 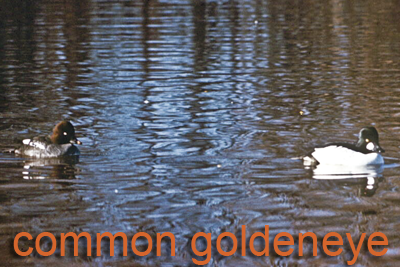 There are presently two varieties of wild turkey common to Texas. 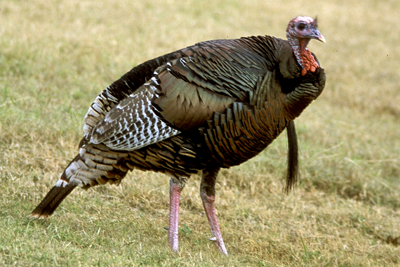 The Eastern turkey, Meleagris gallopavo silvestris, is found in the forests and dense thickets of East Texas and is rarely seen because of its wariness and scarcity. 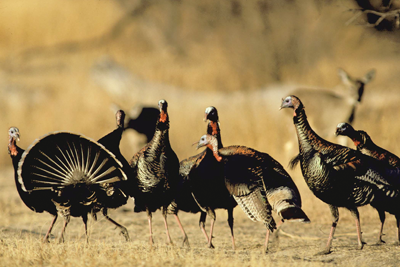 The Rio Grande turkey, Meleagris gallopavo intermedia, is found in most of South, Central and North Texas. The Merriam’s turkey, Melagris gallopavo merriami, once roamed the mountains of West Texas, but were extirpated by 1907. Attempts to restock this turkey have not been successful. For Rio Grande turkey there is a fall and spring season in many counties, in others there is only a spring season. Bag limits can also vary by county. For Eastern turkey there is only a spring season, there are also mandatory check stations where harvested birds must be documented. It is against the law to hunt roosting turkey by any means at any time. 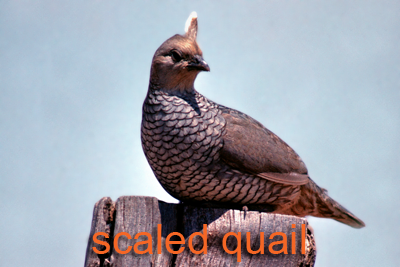 There are four species of quail in Texas; the bobwhite quail, Colinus virginianus, the scaled quail¸ Callipepla squamata, (also known as blue quail), Gambel’s quail, Callipepla gambelii, and Montezuma Quail, Cyrtonyx montezumae. 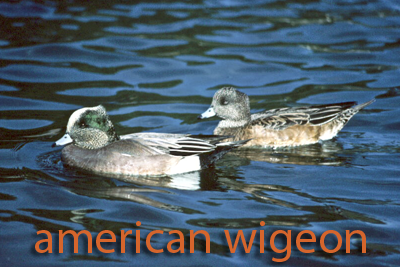 Historically, bobwhites have been the most common though most of Texas, scaled are found in the western third of the state, Gambel’s and Montezuma quail are birds of the desert in the Trans-Pecos. Quail populations can fluctuate wildly and are sometimes referred to as having “boom or bust” population swings. But such short-term population changes do not reflect the long-term downward trend of Texas quail. 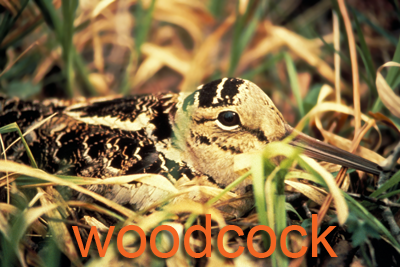 Since 1980, bobwhite populations in Texas have declined at a rate of about 5.6% per year. 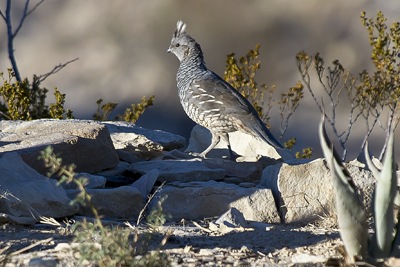 Scaled quail populations have declined at a rate of about 2.9% per year. 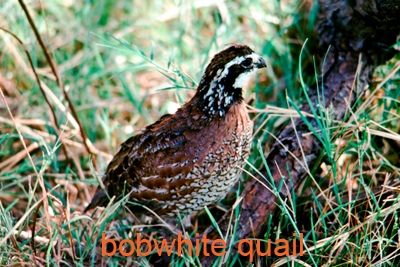 These numbers add up – or down to be more correct to a 75% loss in bobwhites and a 66% loss in scaled quail. 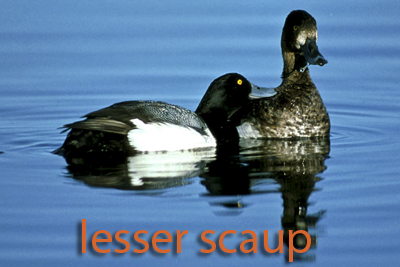 Many reasons are cited for these declines, but the evidence seems to point to changes in the quantity and quality of habitat as the leading cause. 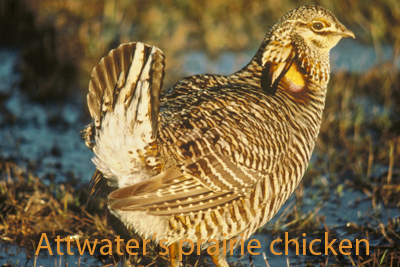 Recent droughts have also reduced quail populations, causing many landowners to suspend hunting to allow populations to recover. 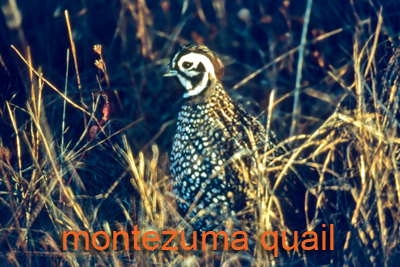 While considered a game bird in Texas, there is no open season for Montezuma quail in Texas. 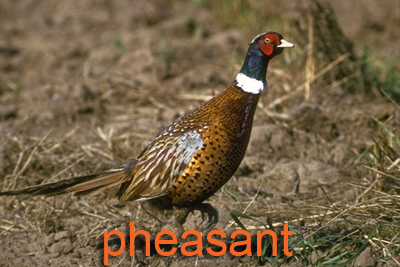 The Ring-necked pheasant, Phasianus colchicus, is not native to Texas but is considered a game bird. In Texas, they are found in the panhandle. 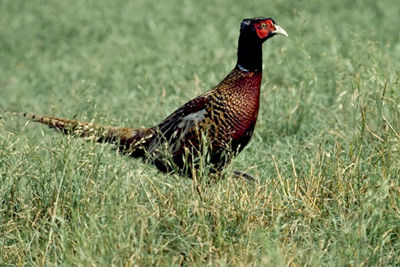 The first pheasants in the High Plains and Northern Rolling Plains of Texas emigrated from western Oklahoma in 1939 or 1940. 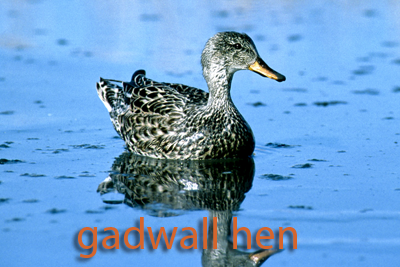 Private releases of birds during the 1930s and 1940s by private landowners in the Panhandle also helped to establish populations in several areas of the region. 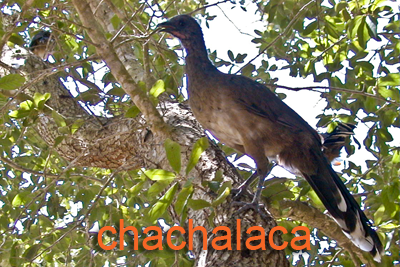 The Plain Chachalaca, Ortalis vetula, typically occurs in small groups of 3-5 individuals in tall, thorny thickets, scrubland, and second-growth forest edge along the Gulf-Caribbean slope from the Lower Rio Grande Valley of Texas and Nuevo Leon, Mexico south to Honduras and Costa Rica. Chachalacas are similar in size and form to a female Ring-necked Pheasant and are named for the raucous, ear-splitting chorus a flock makes. 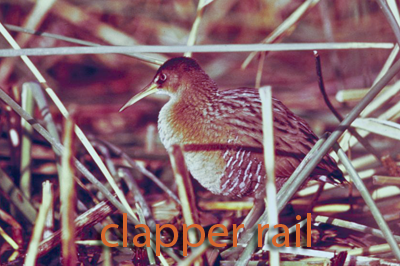 The loud “cha-cha-lac-a” call is most commonly heard during the morning hours, and increases considerably during the February-March breeding season. 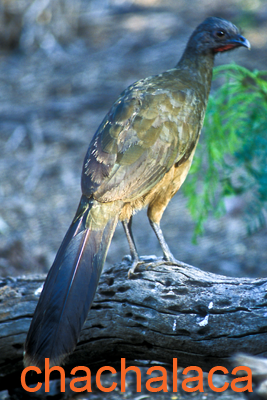 Unlike most other upland game birds, the brownish-olive Chachalaca prefers to spend much of its time in the trees, earning it the nickname of Mexican Tree Pheasant. 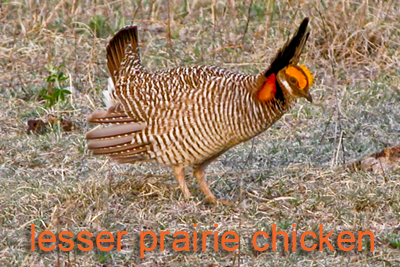 Species with no open season are: the Attwater’s prairie chicken, the Montezuma quail, the partridge (includes chukar) and the lesser prairie chicken. 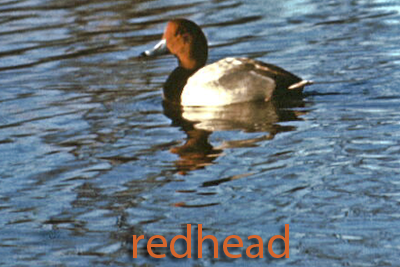 In Texas, migratory game birds include all wild species of ducks, geese, coot, rail, gallinules, snipe, woodcock, doves (mourning, white-tipped or white-fronted) and sandhill cranes. It does not include the exotic collared dove. 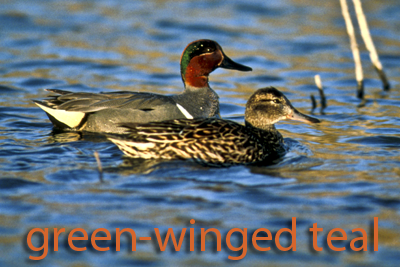 To hunt any migratory game birds in Texas, along with a valid Texas hunting license you will need a Texas Migratory Game Bird Stamp Endorsement and a valid Federal Duck Stamp and HIP Certification. “HIP” stands for Harvest Information Program. 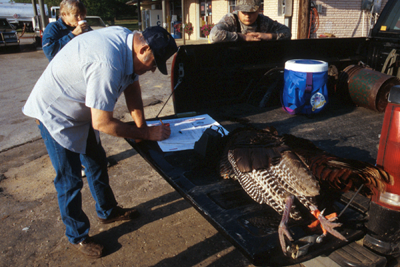 This is a brief survey conducted when you buy a hunting license. 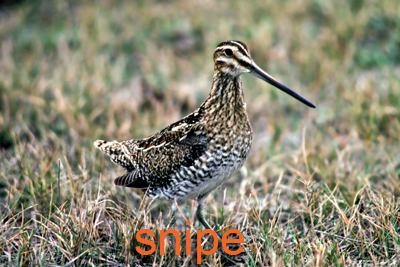 You will be asked if you intend to hunt any migratory game birds during the upcoming hunting seasons and about your hunting success last year. Upon completion, your license will indicate that you are "HIP Certified." There is no cost to you. Certification in this program means that better information will be available to wildlife professionals so they can better manage your wildlife resources. A Federal Sandhill Crane Hunting Permit is required to hunt sandhill cranes, and it’s free but must be obtained at any TPWD Law Enforcement office. 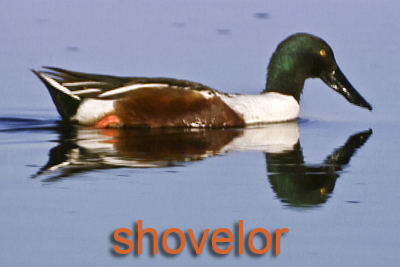 To hunt migratory game birds, shotguns must be plugged so the shotgun’s total capacity is no more than 3 shells. 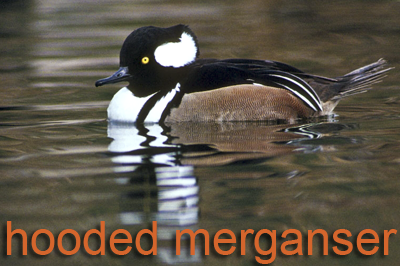 Migratory game birds may not be baited. 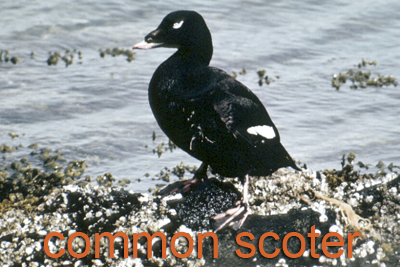 For some species, Texas is divided into zones with specific dates that the seasons are open. Rules and regulations are available in the Outdoor Annual. 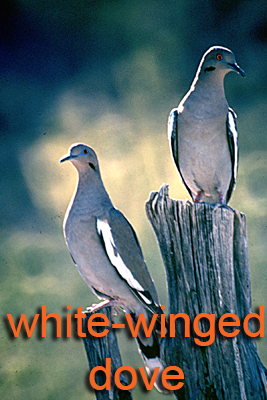 For dove hunting, Texas is divided into North, Central, and South Zones, along with a Special White-Winged Dove Area. White-winged dove were usually only found in the Lower Rio Grande valley area but in recent decades have expanded their range considerably, especially in urban areas like Austin and San Antonio. Please check any doves you harvest for leg bands and report them. The bands are very small and easy to overlook. 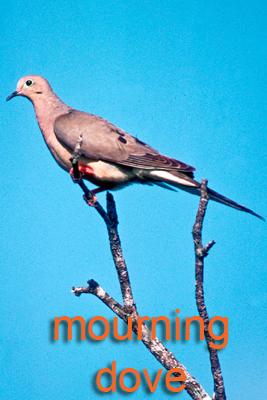 Previous studies indicated two-thirds of banded doves taken by hunters were never reported. High reporting rates maximize return on hunting license dollars spent for needed management information. Please report bands to the toll-free telephone number (1-800-327-BAND ) or on the Internet. 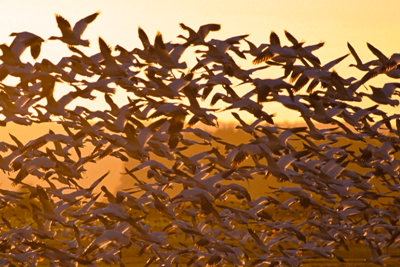 The location of Texas in North America makes it a special place for migratory birds. 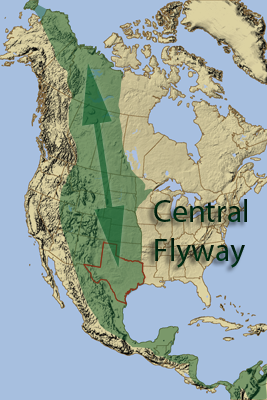 The Central Flyway, a bird migration route, flows straight through Texas. Generally it follows the Great Plains from Canada down through the United Sates and into Mexico, Central and South America. Good sources of water, food, and cover exist over its entire length. 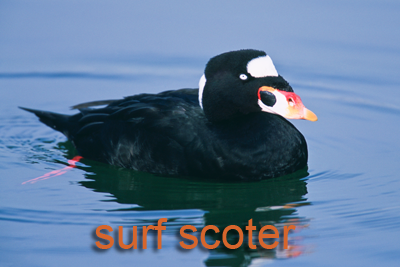 Not all species cover the entire route. Some only go from central Canada to areas around the Gulf of Mexico. Others go from the Arctic Circle all the way to the tip of South America. 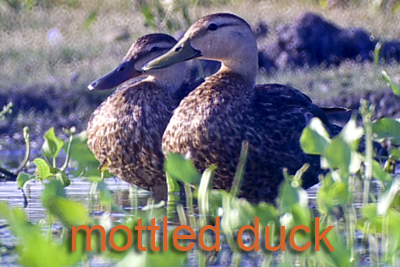 Others, like the mottled duck will stay in Texas year round. 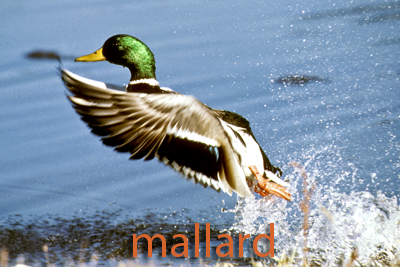 There are 3 duck hunting zones: North, South and the High Plains Mallard Management Unit. 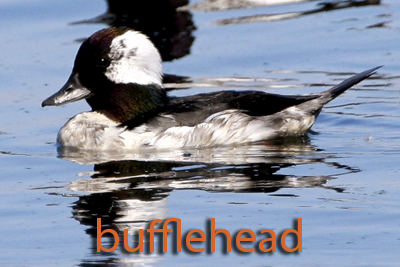 Season dates vary and there are restrictions on mottled ducks, consult the current Outdoor Annual for details. 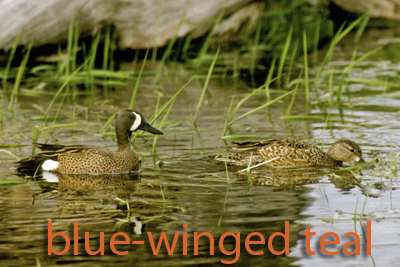 Teal are the first to arrive in Texas and there is a September Teal-only Season. 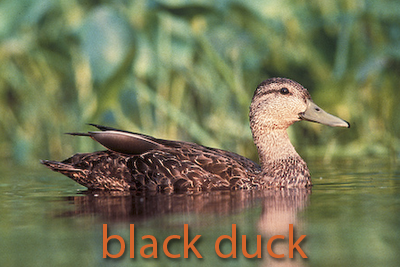 Ducks can be divided into two general categories; puddle ducks and diving ducks. 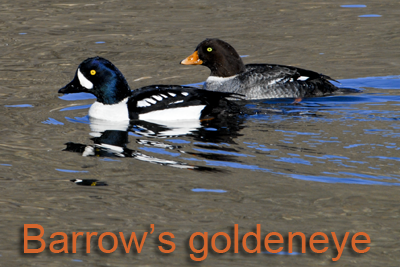 Puddle ducks, also called dabbling ducks, can spring straight into the air to take off. They will tip down with their head under water to feed. 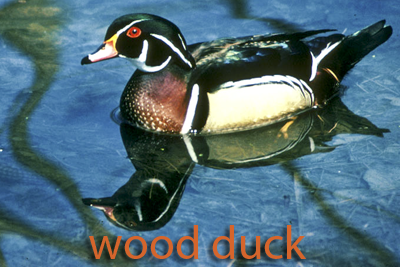 Puddle ducks include: mallard, black duck, mottled duck, Mexican duck, pintail, gadwall, American wigeon, shoveler, wood duck, green-winged teal, blue-winged teal, cinnamon teal, fulvous tree duck, black bellied tree duck and coots. 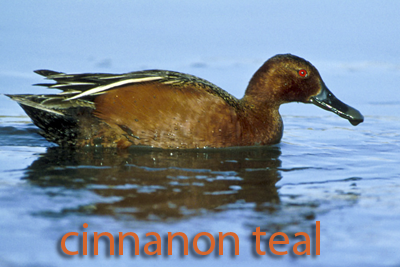 Diving ducks dive completely under water to find food and will patter (run) across the surface of the water to take off. 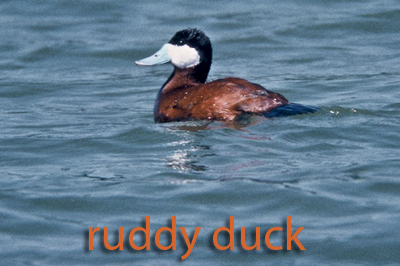 Diving ducks include: canvasback, redhead, lesser scaup, ring-necked duck, bufflehead, common goldeneye, Barrow’s goldeneye and ruddy duck. 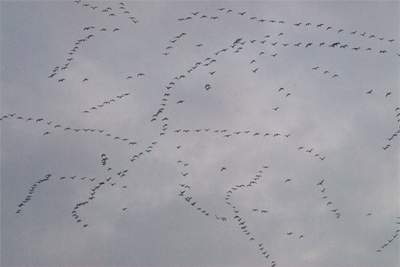 In the fall when cold fronts move down from the north large flocks of geese descend upon Texas. 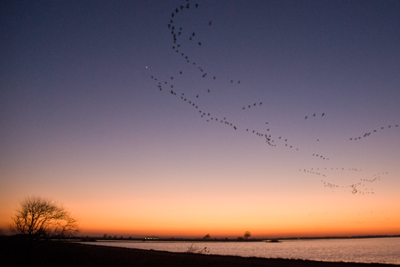 For decades the agricultural fields from Katy to Palacios would draw and hold hundreds of thousands of geese. Drought and water allocation to farmers may disrupt that pattern in the future. 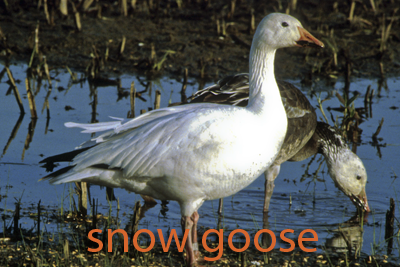 More and more snow geese, for instance, have been wintering in Arkansas. 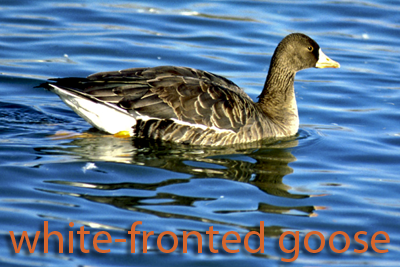 Generally there are light geese and dark geese. 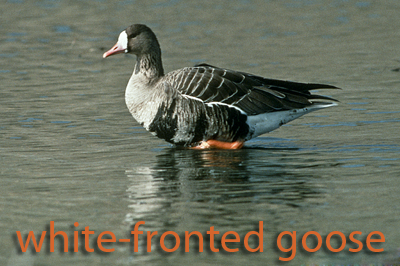 Light geese are snow geese, blue geese, and Ross’ geese. 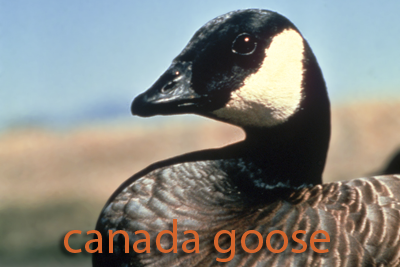 Dark geese are Canada geese, white-fronted geese (also called specklebellies), and Brant. 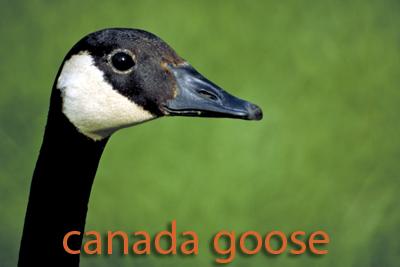 Geese have larger bodies than ducks and frequently fly in large flocks. 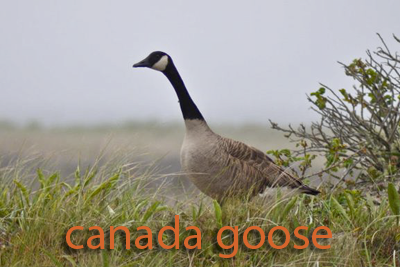 Texas is divided into 2 zones, East and West for geese and there are specific light and dark geese seasons. The Sandhill Crane, Grus canadensis, is a large gray crane with a red forehead, white cheeks and a long dark pointed bill. Both sexes look alike. 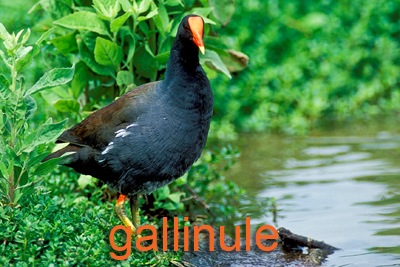 They have a very distinctive call that can be heard over long distances. Texas is split into 3 zones (A,B and C) with the eastern quarter of the state closed to hunting. Dates and bag limits differ in the zones. 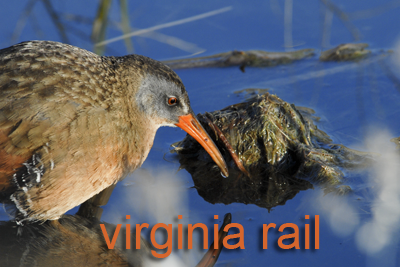 Consult the current Outdoor Annual for details. 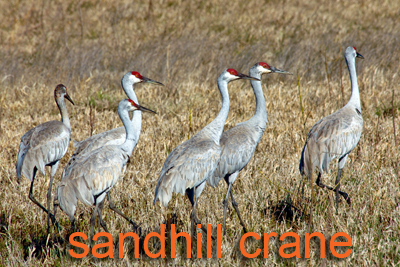 A Federal Sandhill Crane Hunting Permit (Type 590): is required to hunt sandhill cranes. There is no cost for the permit and can be obtained in person ONLY at TPWD Law Enforcement offices and TPWD headquarters in Austin, but also is available by phone at (800) 792-1112 (option 5, menu 2) or (512) 389-4820, 8 a.m. – 5 p.m., Monday through Friday or online any time. For phone and online orders, a confirmation number will be issued in lieu of a permit. A $5 transaction fee will be charged for online orders. Permittees should keep a record of hunting activities because 26% of crane hunters are chosen for a federal harvest survey. 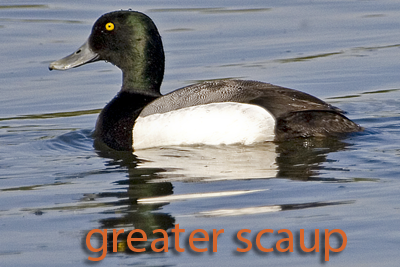 For merganser, gallinule, coot, rail, snipe and woodcock all have unique seasons and bag limits. 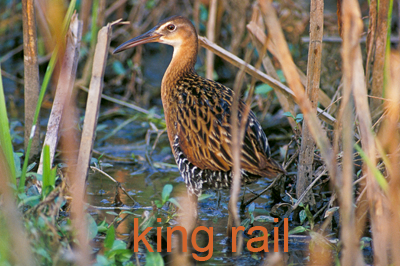 Consult the current Outdoor Annual for details.